There are top of the line products. Everyone knows these brands. Everyone raves about the products they produce. These brands have huge advertising budgets. Their prices are a tad higher, as they have to cover their advertising, buildings, overheads, etc. They can spend a lot of money on R&D. As a result, they keep making premium, top of the line golf equipment. However, now they have to cover their R&D costs, which tend to be pretty large. They pass those costs on to you, but you pay it nonetheless because you want the name brand. There are crappy products. You know the ones. You see them all over eBay and Amazon. They have no budgets, don’t advertise, have their golf items made overseas for cheap. You’ve never heard of their brand names before, if they even have one. There are some special unicorns that somehow fell through the cracks. 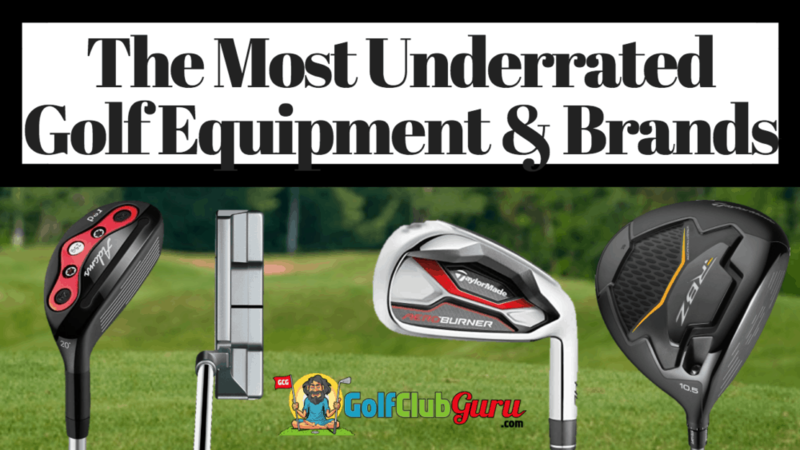 They produce INCREDIBLE golf equipment at an INCREDIBLE price. People don’t give them the credit that they deserve. Many people don’t even know about these products. If they do know about them, they might not realize just how great of a product these are. They might see the low price tag and just assume the quality is poor. But boy are they wrong! This section is the category that this article is going to be about. So how do these golf items go underrated for so long? Great question. There are a number of reasons. To begin with, these brands might just not have enough of an advertising budget to get the word out. They might rely solely on word of mouth, which can be a slow process. Or the product could be from a top brand, but it was overshadowed by a different brand’s product that was released at the same time. Lastly, it could be a lower tier brand (like Wilson) that typically makes poor quality products. Every now and again, though, they can produce some incredible quality golf equipment that ends up being completely underrated. Note: all links will take you to the respective clubs available on eBay if you click on them. What an incredible driver the Cobra LTD is. I can’t express how great the drives felt at impact. It was like butter, which is not a common characteristic or feeling for a driver. I felt like I simply couldn’t miss when I tried it at my local course’s demo day. I am 100% going to be buying this driver soon (hopefully from revenue from this site). And when I do, you won’t be able to get me off the range. Cobra drivers in general have simply always been a little underrated. Cobra is coming back from a couple of years of lame products, but they hit have hit it out the park, especially with drivers and fairway woods, since around 2014. Starting with the Bio Cell driver, they have made tons of high quality drivers since then, yet they still haven’t received the recognition that they deserve. Adams makes some very good value three woods, no question about it. They are the perfect mix between being easy to hit on the fairway and easy to hit off a tee. The Adams Tight Lies woods are way better than people realize. The face of the club makes it super easy to hit the ball high and far off the turf. On the tee, I feel like I can really launch it without worries of it floating too quickly, which is hard for me to come by in a fairway wood. Plus, I love the design and the small profile of the club. The all black look is very appealing, and the clubhead is compact enough to get through some tall grass and debris if needed. Everyone knows that Adams makes good hybrids. However, not everyone realizes that they can get a top of the line hybrid for under $50 brand new. The deals on Adams Red and Adams Pro are neck and neck in my opinion, but the prices for Adams Red is just stupid low for how good of a club it is. Adams Red hybrids fly high very quickly. Many people struggle with stopping balls on the green because they can’t get enough air on their shots. If that is the case for you, I’d recommend you try these out! These TaylorMade Burner HL irons have always had their limelight taken away from flashier looking sets of game improvement irons. However, they are so forgiving and so easy to hit high in the air. Sure, distance control can be difficult at times, but the forgiveness factor far outweighs any downsides to these irons. If you struggle with consistent contact, these are the irons for you. They are moderately priced, because they are so underrated. The Aeroburner models of clubs were a low budget option for golfers that couldn’t afford the more expensive clubs at the time. However, the quality is just the same, with the only difference being more forgiveness and bigger club heads! I hardly ever recommend Wilson golf clubs (they actually do many some great sets of clubs now, but that’s another story). However, it’d be dumb to not mention these wedges. These wedges will perform nearly just as well as the top of the line Vokeys and Clevelenad 588 RTX’s. These Wilson Harmonized wedges might spin a tad bit less, but that is not a problem for a mid-high handicapper. If you are looking for a very undervalued set of wedges, these are the ones for you. You can get a set of 2-3 for the cost of just one of the premium wedges. Cleveland Milled putters (like the Huntington Beach set, the Cleveland Classics set, and the 2135 set) are top of the line. I am convinced that they have always just been overshadowed by Scotty Cameron. However, these putters are just as solid, and they are made very similarly. For half the price of a Scotty Cameron, you can get a premium milled putter that is absolutely beautifully crafted. I’ve always been a huge fan of milled putters vs insert putters, but that is just personal preference. I’ve said it many times, and I am going to continue to say it. Srixon Soft Feel golf balls are the best Titleist Pro V1 alternative under $20. I wouldn’t be surprised if they completely run out of stock this year, as the ball has been made for many years. These balls have simply flown under the radar for as long as I have known about them. That’s OK with me though. If everyone knew how great this ball was when it came to distance, spin, and feel, Srixon would surely raise the price! MG golf gloves are absolutely, without a doubt the most underrated golf gloves on the market. They sell for super cheap, especially if you buy multiple. These gloves are made with premium leather, just like the gloves that cost $25+. However, MG does no advertising. They rely simply on good reviews on Amazon, which I foresee them continuing to receive in the future. I bought my first MG glove a month ago and I have been absolutely hooked ever since. It fits so snug and looks like it costs 3x what it really does. It’s just a matter of time before they become more popular and start charging more for their premium gloves. Adams produced high quality clubs at every level. They have great drivers (like the XTD and Speedline models), very underrated fairway woods (see above), top of the line hybrids (see above again) at a super low price, great irons (like their XTD and Idea models) and combo sets, and Tom Watson wedges at a steep discount. Plus, they own the Yes! brand of putters, which makes putters that are nearly just as underrated as Cleveland Classics. All together, Adams Golf is just an underrated brand in golf. They have priced their equipment below average for as long as I can remember, so they can’t just change that all of the sudden. A close runner up would be Cleveland in my opinion. They make incredible putters like I mentioned above, the best irons on the market (in my opinion better than Vokey’s), a wide variety of irons sets that most people forget about, and some great drivers as well. They don’t excel in the hybrid and fairway wood category, though, so I decided to go with Adams overall. In third place, I would say Wilson earns a spot here. They make some great budget complete sets. They also produce top of the line golf equipment for their staff, which most people don’t realize. They have everything from game improvement irons to blades for their top sponsors. They have also released some great value wedges (like I listed above) and drivers too. They used to be the #1 brand in golf, so it’s strange that they fell off the map that quickly and reduced their prices so much. Throughout the grand pattern of things you secure a B- for hard work. Where you confused us was first in your particulars. You know, as the maxim goes, the devil is in the details… And that could not be more correct right here. Having said that, let me reveal to you precisely what did work. Your article (parts of it) is actually quite convincing and that is most likely the reason why I am taking an effort in order to opine. I do not make it a regular habit of doing that. Secondly, while I can see the leaps in reasoning you come up with, I am not really confident of exactly how you appear to connect the points which in turn produce your conclusion. For the moment I will yield to your point however hope in the foreseeable future you connect the facts much better.